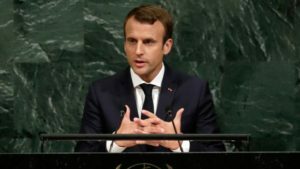 French President Emmanuel Macron Sunday laid into Donald Trump after the American President instructed US troops in Syria to return home following discussions with Turkey. “An ally should be dependable,” Macron said during a press conference in Chad. “To be allies is to fight shoulder to shoulder. It’s the most important thing for a head of state and head of the military,” he said. Trump Wednesday announced the withdrawal of some 2,000 US forces present in the war torn-country where they had been giving support to Syrian Democratic Forces (SDF), Kurdish forces combatting the Islamist State group. The decision according to US officials came in the wake of conversations between Trump and his Turkish counterpart Recep Tayyip Erdogan. The telephone conversation between two leaders took place as Turkey gears to launch a major offensive in northern Syria to crush its staunch opponents, the PKK group, that it believes are affiliated to the People’s Protection Units (YPG), a branch of the SDF. Trump twitted he got assurance from Erdogan to flash out terrorism after US troops leave. Trump’s decision, which has been enacted, took US allies in Syria by surprise and led to the resignation of US Defense Secretary James Mattis. Macron reportedly hailed James Mattis on his decision to resign following a fallout with Trump over Syria. The US is leading 12-nation coalition in Syria, entangled in a civil war since 2011. Written by: KanelkaTagba on December 24, 2018. Posted by KanelkaTagba on Dec 24 2018. Filed under Headlines, World News. You can follow any responses to this entry through the RSS 2.0. Both comments and pings are currently closed.